Apply eye gel patch with under-eye sticker on top and half out of the patch. Apply stickers to cover and protect bottom lashes. Using Diamond Dusted Forceps, create a fan of American Volume lashes and apply. Dip the bottom point of the lashes in adhesive and use Curved Dumont Forceps to isolate a single natural lash. Apply the fan on top of the natural lash near the root. Using the American Volume lash extensions, apply at least three different lengths to create a fuller look. To balance two different-sized eyes in this case, different curls such as 0.05mm C curl 8 and 14 and D curl 8, 10, 12 and 14 were applied to balance the eye shape. Once the American Volume extensions are completely applied, Josephine selected Candied Lashes in Sugar Plum (Purple) and Butterscotch (Gold) to match the client’s dress for the evening. Measure the Candied Lash to the natural lash. Candied Lashes come in 14mm lengths, so trim them to produce three different sizes to blend into the outer corner. Trim from the bottom, taking care to avoid cutting the fine tapered tip. Dip the Candied Lash in a dot of NovaLash adhesive. Avoid covering up the glitter on the lash with the adhesive. Apply lashes individually. Once all lashes are applied, use the AirNova to speed up the adhesive curing process and give lashes a fluffier finish. For a glamorous holiday makeup look, apply NovaLash 24-Hour Cream Shadows. 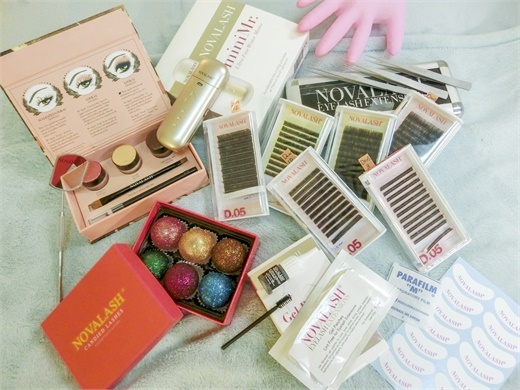 Adhesive: NovaLash Platinum Bond-High Speed for American Volume and Candied Lashes, Sensi5tive Eyes Adhesive for bottom lashes. The Aura to balance humidity levels, allowing optimum drying and curing of the adhesive. NovaLash 24 Hour Cream Shadow Triptychs in Garden of Eden with JETliner eyeliner pencil.